Paris – Dream or Reality? Living in a quaint apartment with floor to ceiling windows overlooking the Seine has always been a treasured dream. To know the ways of Paris and melt into the culture draws me with a magnetic force, so compelling, that I almost wonder if I did not live there in a past life. But is my dream Paris actually obtainable, or will the brick and mortar city of lights present a different face once I finally arrive? Well, I am about to find out. Our flight takes off at 5:20 p.m. on May 31st. The last day of the month. Even though the actual time in the air is 9 hours, we arrive the next day – June 1st – at 9:30 a.m. Do they tell you when you have passed midnight and entered a new day? Or does it flow seamlessly by, unnoticed and unmarked by sleeping airline passengers? We are taking the B line train to our apartment in St.-Germain-des-Pres. An adventure in itself, to navigate the airport, find the ticket window, communicate where we are going, pay in euros, board the correct train and arrive at the St. Michael station. When the flickers of anxiety about what could go wrong touch me, I take a deep breath and see the entire process going smoothly. And my thoughts, intention and desire make it so. This same approach is how I am going to move through this wonderful adventure. Moment by moment, I will be open to the wonder, joy and excitement that is Paris. They say that the air in Paris is different – if it is, I will confirm it. Memories are made from the moments of life. I plan to string my memories together in a necklace of delicate beauty, encased in the rarest emotional jewels and hung on a golden strand of joy de vivre. And you, my dear readers, will accompany me as I w rite about those moments and the necklace begins to fill. I know that a city as densely populated, historically significant and holding so many tourist attractions will have many faces. 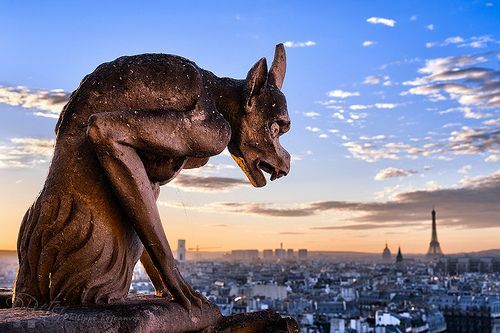 To me, even the gargoyles are intriguing! Whatever face Paris shows me, I will be curious, accepting and enthralled. And maybe, just maybe, I might spot the side of Paris that has haunted me in my dreams.